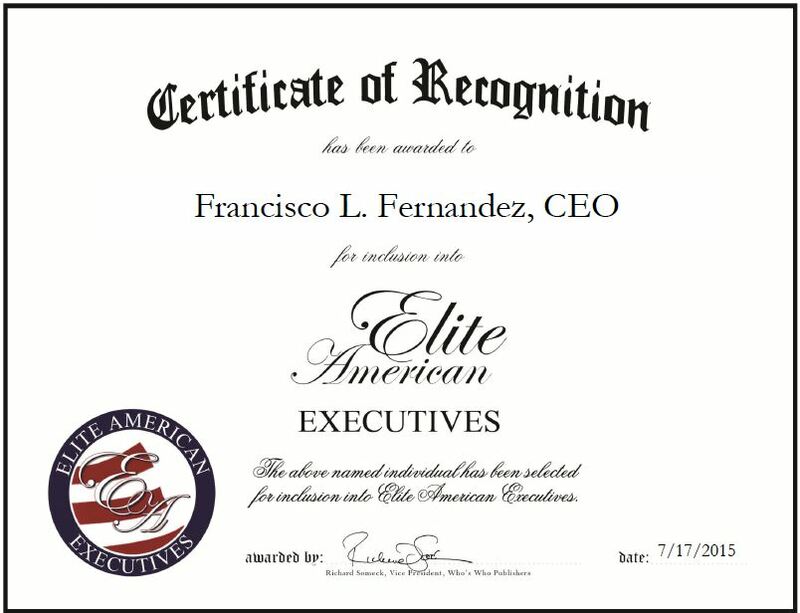 Company: Sener Engineering and Systems Inc.
Los Angeles, CA, July 17, 2015, Francisco L. Fernandez, Chief Executive Officer of Sener Engineering and Systems Inc., has been recognized by Elite American Executives for dedication, achievement and leadership in engineering and construction. Mr. Fernandez is a highly regarded executive who has been involved in his profession for 42 years. Mr. Fernandez assumed his current role nearly a year ago and makes sure he participates in the business development and bidding process for the team of the civil and infrastructure division in the U.S. and especially in the structuring of private public partnership projects. A well-respected leader, Mr. Fernandez excels in the area of transportation infrastructure, including rail, lightrail and high speed rail. Throughout his career, Mr. Fernandez served as deputy CEO of Iridium for 15 years, the ACS group infrastructures concessions company. He also served as vice president for business development and as CEO of the ACS Group affiliate for Infrastructure Investments INVINSA. Additionally, Mr. Fernandez was the first technical manager of the Madrid Transportation Authority Coordination of the construction of the Madrid to Seville HSR Line and general manager for the Metropolitan Projects at the Spanish Ministry of Public Works, and the head of the concession arm in the ACS Group. Mr. Fernandez is eager to give back to the profession and has taught at the university level, at Universidad Europea de Madrid (UEM). He taught special international complex projects students pursuing their master’s degrees in civil engineering for two years. Mr. Fernandez attributes his success to his dedication. In the coming years, he will stabilize the U.S. and Canadian markets, put it in a trend and have a relevant position in a specialized scope. This entry was posted in Engineering and tagged construction, lightrail, professor, project management, rail, speed rail, transportation infrastructure. Bookmark the permalink.